Bet you didn’t know there could be so much more to your boring old regular ketchup squirt. I didn’t. Then again, if you don’t question, you don’t act, Â you don’t change, you remain the same. And boring. Because you didn’t know you could have VARIETY. Matt and Kori Wallace, newly weds/innovators/foodies/entrepreneurs have been busy working on bringing we the diners, a new and fresh way to enjoy ketchup. Â The DC-based couple has developed a line of fruit ketchups, called â€˜Chups, and have just launched a 45 day Kickstarter crowdfundingÂ campaign TODAY, January 21st, to raise $12,000 in startup funds. Supporters of the campaign will help bring their products to restaurants and store shelves throughout the region. Thanks to Heinz, we are programmed to think ketchup was, is and always will be made with tomatoes, but when you watch the Kickstarter video, you learn a bit of history on that red sauce. â€œCooks brewed delicious blends of fruits, vinegar, spices and other ingredients long before tomato ketchup became a household staple. Our goal is to bring these different flavors back into American cuisine,” says Matt. 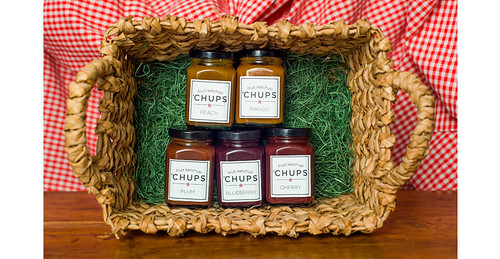 The â€˜Chups line of fruit ketchups feature five original flavors: cherry, blueberry, peach, mango, and plum. Each variety uses whole fruits and other natural ingredients instead of tomatoes, but still has the same tangy and sweet zip of tomato ketchup.